Background and objectives: Potential therapeutic interventions are being developed for autosomal dominant polycystic kidney disease (ADPKD). A pivotal question will be when to initiate such treatment, and monitoring disease progression will thus become more important. Therefore, the prevalence of renal abnormalities in ADPKD at different ages was evaluated. Design, setting, participants, & measurements: Included were 103 prevalent ADPKD patients (Ravine criteria). Measured were mean arterial pressure (MAP), total renal volume (TRV), GFR, effective renal plasma flow (ERPF), renal vascular resistance (RVR), and filtration fraction (FF). Twenty-four-hour urine was collected. ADPKD patients were compared with age- and gender-matched healthy controls. Results: Patients and controls were subdivided into quartiles of age (median ages 28, 37, 42, and 52 years). Patients in the first quartile of age had almost the same GFR when compared with controls, but already a markedly decreased ERPF and an increased FF (GFR 117 ± 32 versus 129 ± 17 ml/min, ERPF 374 ± 119 versus 527 ± 83 ml/min, FF 32% ± 4% versus 25% ± 2%, and RVR 12 (10 to 16) versus 8 (7 to 8) dynes/cm2, respectively). Young adult ADPKD patients also had higher 24-hour urinary volumes, lower 24-hour urinary osmolarity, and higher urinary albumin excretion (UAE) than healthy controls, although TRV in these young adult patients was modestly enlarged (median 1.0 L). Conclusions: Already at young adult age, ADPKD patients have marked renal abnormalities, including a decreased ERPF and increased FF and UAE, despite modestly enlarged TRV and near-normal GFR. ERPF, FF, and UAE may thus be better markers for disease severity than GFR. Autosomal dominant polycystic kidney disease (ADPKD) is the most prevalent inherited renal disease with an estimated prevalence between 1:400 and 1:1000 (1). The disease is characterized by pain, hematuria, and most importantly by progressive cyst formation in both kidneys, often leading to ESRD. Annually, 7.8 male and 6.0 female individuals per million of the population start renal replacement therapy in Europe because of polycystic kidneys, which is 6% of the new ESRD patients (2). Current treatment cannot prevent renal failure. (3,4) However, a better understanding of the pathophysiology of the disease and the availability of animal models identified promising candidate drugs for renal preservation (5). Clinical trials have been initiated for vasopressin-2 receptor antagonists, long-acting somatostatin analogues, and mammalian target of rapamycin inhibitors (6). When efficacy of these agents has been established, a pivotal question will be when to initiate such treatment. Given that ADPKD is a progressive condition, it seems most appropriate to initiate intervention as early in life as possible to delay or prevent long-term consequences, including renal failure and cardiac complications. On the other hand, ESRD occurs in approximately 50% of affected subjects (7,8), and it is not appropriate to expose those subjects that will not reach ESRD to excessive medical treatment to such an extent as to cause adverse events, especially because all candidate drugs have considerable side effects. Because of these reasons, it will be important to discover markers that identify ADPKD patients who will develop rapid disease progression. In such patients, therapy could be instituted in an early phase. It will therefore become important to define disease severity in ADPKD. Criteria to make this distinction are not crystal clear. GFR is believed to be stable for a long period, despite progression of renal anatomical abnormalities, because of compensatory hyperfiltration. GFR is therefore assumed not to be representative of disease severity (9,10). Total renal volume (TRV) has been proposed as a surrogate marker for disease progression (10). However, despite a significant overall association, there are subjects with a high TRV but normal renal function (11). Another parameter that is decreased early in the disease is urine concentrating capacity (12). Other candidate markers to define disease severity are albuminuria (13,14) and renal blood flow (RBF) (15,16). Despite evidence for the importance of finding early renal abnormalities in ADPKD, systematic evaluation of hemodynamic parameters, especially with respect to RBF, renal vascular resistance (RVR), and filtration fraction (FF), has received little attention. Therefore, we investigated renal parameters in ADPKD at different ages in comparison to healthy subjects. One hundred and eighteen consecutive patients with ADPKD visiting our outpatient clinic, meeting our inclusion and exclusion criteria were asked to participate. Diagnosis of ADPKD was made based on Ravine criteria (17). Subjects were ineligible to participate if they were on renal replacement therapy; had undergone renal surgery; were unable to undergo magnetic resonance imaging (MRI) (as having distorting foreign bodies or aneurysmal clips); had other systemic diseases potentially affecting renal function (as diabetes mellitus and malignancies); or had other medical conditions that included pregnancy, lactation, or who were <6 months postpartum. After screening, subjects underwent an extensive medical history. Thirteen patients refused to participate and two patients were not eligible to participate, leaving 103 patients for analyses. Subjects were scheduled for a 1-day outpatient clinic evaluation. Values of these patients were compared with healthy controls. These were drawn from a pool of subjects who were screened for live kidney donation and underwent the same evaluation, but without MRI (n = 103). Values for healthy controls depicted in tables or figures are derived from these live kidney donors. Twenty-four-hour urine collection was not available for all donor screenees. 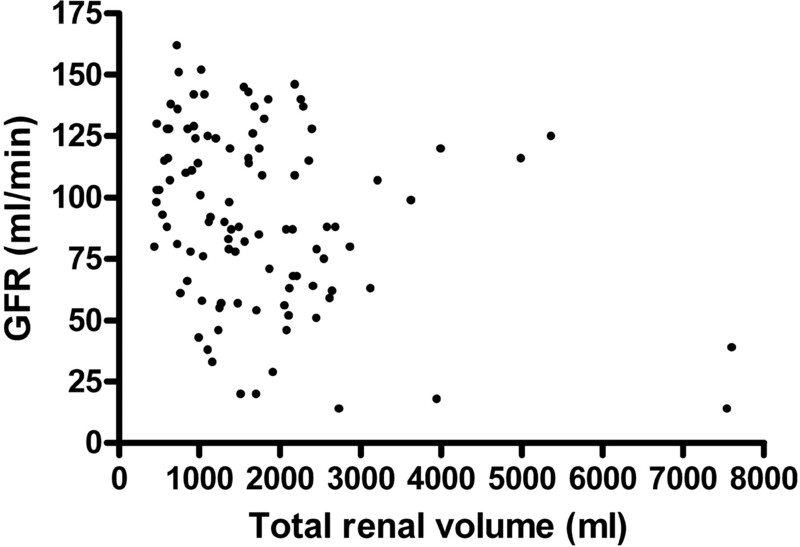 Values considering 24-hour urinary volume (osmolarity and albumin excretion) were therefore drawn from subjects participating in the Prevention of Renal and Vascular Endstage Disease (PREVEND) study (n = 103) (18,19). Controls were matched for age and gender with ADPKD patients and were considered healthy in case they had a history without cardiovascular and/or renal disease and used no medication [other than antihypertensive medication, but no angiotensin converting enzyme inhibitors (ACEIs)/angiotensin receptor blockers (ARBs)]. All patients and controls were of Caucasian ethnicity. There was no difference in age (P = 0.7), gender (P = 0.9), mean arterial pressure (MAP; P = 0.4), body surface area (P = 0.5), or body mass index (BMI; P = 0.7) between the two control groups (live kidney donors and the subjects from the PREVEND study). Study site and laboratory methods were the same for patients and the control groups (all subjects were seen in one institution). This study was performed in adherence to the Declaration of Helsinki. All subjects gave written informed consent. Blood pressure (BP) was assessed with an automatic device (Dinamap) for 15 minutes during the renal function measurement. Systolic and diastolic BP values were used to calculate MAP using the standard formula MAP = 2/3 × diastolic BP + 1/3 × systolic BP. Patients collected a 24-hour urine sample before the outpatient visit. Weight and height were determined. BMI was calculated as weight in kilograms/height2 (measured to the nearest 0.5 kg and 0.5 cm, respectively). Urinary albumin concentration was determined by nephelometry (BNII, Dade Behring Diagnostics, Marburg, Germany). Blood samples were drawn before renal function measurement for determination of serum electrolyte, hemoglobin (Hb), creatinine, and urea. Concentrations of Hb, sodium, potassium, cholesterol, and glucose were measured in serum or urine using standard methods. Creatinine was measured with the Roche enzymatic creatinine assay. Creatinine values were used to calculate an estimated GFR (eGFR) using the abbreviated Modification of Diet in Renal Disease formula (20). Microalbuminuria was defined as a urinary albumin excretion (UAE) of >30 mg/24 h. Urinary osmolarity was calculated as urinary osmolarity = 2(urinary sodium concentration + urinary potassium concentration) + urinary urea concentration (21). This calculated osmolarity was not different from measured values (independent sample t test P = 0.94 in 100 samples, measured in our own laboratory). Renal function measurements were performed using the constant infusion method with 125I-iothalamate and 131I-hippuran (22,23). Patients came nonfasting and were able to drink ad libitum except for no caffeinated drinks. Antihypertensive medications were not withheld. Smoking was not allowed during the measurement. After drawing a timepoint-0 blood sample, a priming solution containing 20 ml of infusion solution (0.04 MBq of 125I-iothalamate and 0.03 MBq of 131I-hippuran) was given at 08.00 hours, followed by a constant infusion at 6 to 12 ml/h, with the lowest infusion rates in subjects with impaired renal function on the basis of previously known serum creatinine. Plasma concentrations of both tracers were allowed to stabilize during 1.5 hours of equilibration, which was followed by two 2-hour periods for simultaneous clearances of 125I-iothalamate and 131I-hippuran. Clearances are calculated as U × V/Piot and (I × V)/Phipp, respectively. Because urinary clearance of 131I-hippuran equals plasma clearance, in case of perfect urine collection, we routinely use the ratio of plasma-to-urinary clearance of 131I-hippuran to correct urinary clearance of 125I-iothalamate for voiding errors (24). This method to correct for urinary collection errors is extensively described and validated (22–24). Coefficient of variation for GFR is 2.5% and for effective renal plasma flow (ERPF) is 5% (22). RBF was calculated as ERPF/(1 − hematocrit). RVR was calculated as MAP/RBF × 80,000 (16,25). Patients underwent a standardized abdominal MRI protocol without the use of intravenous contrast. Scanning was performed on a 1.5-Tesla MRI Magnetom Avento (Siemens, Erlangen, Germany) with the use of body matrix and spine matrix coils. T2 weighted fast imaging (true FISP) series were scanned during breath-hold. T2 weighted turbo spin echo (HASTE) series were scanned during free breathing with breath triggering on the diaphragm (prospective acquisition correction—PACE). Transversal images were obtained with a fixed slice thickness of 5.0 mm. Coronal images were obtained with a fixed slice thickness of 4.0 mm. Renal volume was measured on T2 weighted coronal images. Analyze Direct 8.0 (AnalyzeDirect, Inc., Overland Park, KS) software was used to analyze the volumes. Foxel size was forced to cubic to allow for three-dimensional viewing. Manual selection of the renal contours on every fifth slice with semiautomated propagation was used to obtain full selection of the kidneys, excluding the pyelum. All contours were checked manually before assessing TRV. Analyses were performed with SPSS version 16.0 (SPSS, Inc., Chicago, IL). Parametric variables are expressed as mean ± SD, whereas nonparametric variables are given as median (interquartile range). A two-sided P < 0.05 was considered to indicate statistical significance. Differences between ADPKD patients and healthy controls were tested using an independent sample t test when normally distributed or a Mann–Whitney test when not normally distributed. Analyses were performed for ADPKD patients and healthy controls and divided into quartiles of age, illustrating the differences between patients and controls in the different stages of disease. P values for differences between the age quartiles were obtained using an ANOVA or a Kruskal–Wallis test. To investigate whether TRV was associated with GFR, ERPF, FF, and RVR, multiple regression analysis was performed. Logarithmic transformation of TRV and RVR was applied to fulfill the requirement of equal distribution of the residuals. Stepwise, various models were built to adjust for possible confounding. First these associations were investigated crude and second were adjusted for age and gender. A total of 103 ADPKD patients participated in this study; 60 (58%) were male. Mean age was 40 years. Table 1 depicts characteristics of ADPKD patients and of healthy controls. MAP was higher in the ADPKD group, despite frequent use of antihypertensive medication. TRV was not measured in these healthy controls, but from literature it is known to be approximately 330 (194 to 614) ml (26). Hb concentration was lower in ADPKD patients. Renal function, measured as clearance of iothalamate and estimated by the Modification of Diet in Renal Disease equation, was also lower. In ADPKD patients, 24-hour urinary volume was 2.4 ± 0.8 L, whereas this was 1.6 ± 0.6 L in 103 age- and gender-matched subjects participating in the PREVEND study (P < 0.001). UAE was also higher in ADPKD patients [42 (14 to 131) versus 7 (6 to 10) mg/24 h], whereas calculated urinary osmolarity was lower (421 ± 147 versus 568 ± 181 mOsm/L, both P < 0.001). For further analyses, ADPKD patients and healthy controls were subdivided into quartiles of age, as shown in Table 2, which shows the same variables as Table 1 but depicted per quartile of age, illustrating differences in variables under study between the different age categories. Variables that were different for the quartiles of ADPKD patients were use of antihypertensive medication, serum creatinine, eGFR, ERPF, and RVR. Variables that were different for the quartiles of healthy controls were Hb, eGFR, ERPF, RVR, and FF. Renal hemodynamic parameters for quartiles of age are depicted in Figure 1. GFR, ERPF, FF, and RVR are shown per quartile of age for ADPKD patients and for healthy controls in the same graph [mean ± 95% confidence interval (CI) of the mean and for RVR median and interquartile range is shown]. ERPF was decreased in ADPKD patients already in the first quartile of age, with a further decline with increasing age. In the youngest age quartile, GFR was not significantly different between ADPKD patients and healthy controls; consequently, FF was considerably increased. In the older age cohorts, GFR decreased progressively in ADPKD and much less steep in the healthy controls. 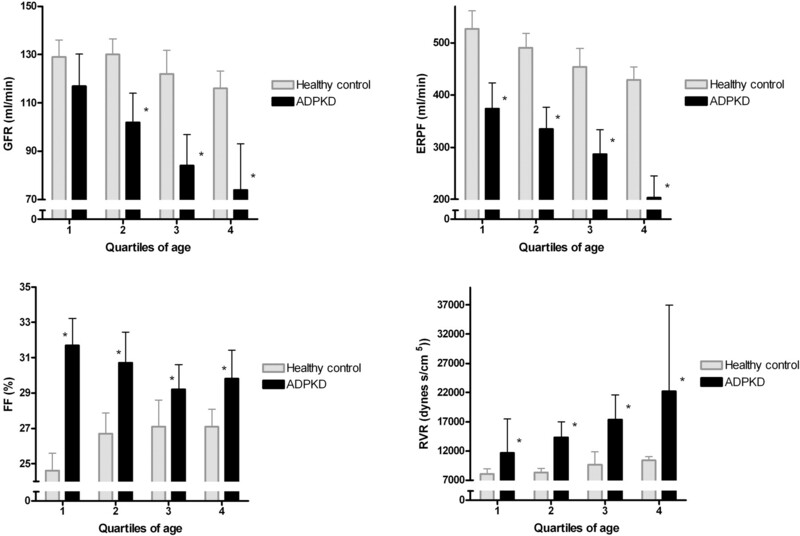 Consequent to the parallel decreases in ERPF and GFR in ADPKD with increasing age, the elevated FF remained constant over the age quartiles, whereas in the healthy controls, FF increased with age. Within the healthy controls, BMI (R2 = 0.09, P = 0.002) and age (R2 = 0.07, P = 0.008) were associated with FF, whereas these variables were not significantly associated with FF within the ADPKD patients (P = 0.4 and 0.1, respectively). Within the ADPKD patients, FF was significantly associated with female gender (R2 = 0.05, P = 0.02) and inversely with use of ACEIs or ARBs (R2 = 0.07, P = 0.01). Seventy-one of the 103 ADPKD patients used an ACEI/ARB; these patients had a lower FF than the patients who did not use an ACEI/ARB (30 ± 4 versus 32 ± 4, P = 0.01). Patients taking an ACEI/ARB had the same Hb level as patients without these agents (P = 0.45). As a consequence of the decreased RBF and the tendency toward a high MAP in ADPKD patients, RVR was high, with 12 (10 to 16) dynes/cm2 in the youngest quartile of age and 22 (18 to 33) dynes/cm2 in the oldest quartile. Renal hemodynamic parameters (mean values + 95% CIs and for RVR median values and interquartile range) in ADPKD patients (n = 103) and healthy controls (n = 103). *P < 0.05 compared with healthy controls in the same quartile of age. In ADPKD patients, TRV was related to GFR [standardized β (st β) = −0.31, P = 0.002], ERPF (st β = −0.23, P = 0.02), FF (st β = −0.33, P = 0.001), and RVR (st β = 0.33, P = 0.001). After adjustment for age and gender, these associations did not change materially (Table 3). Although there was an association between TRV and GFR, there were several patients with large kidneys but still a reasonable renal function, and patients with relatively small kidneys but already a markedly decreased renal function (Figure 2). Association between TRV and GFR for participating ADPKD patients (n = 103). UAE was elevated already in the first quartile of age compared with healthy controls [70 (19 to 131) versus 7 (5 to 10) mg/24 h]. Sixty-eight percent of these patients in this age quartile were microalbuminuric, whereas 56% of the patients in this age quartile used ACEIs or ARBs. ADPKD patients with microalbuminuria had significantly larger kidneys than patients with normoalbuminuria (P < 0.001). Of note, patients in the youngest quartile of age without microalbuminuria (n = 8) already had a decreased ERPF and increased FF and RVR compared with healthy controls, whereas GFR was again not different from healthy controls. Twenty-four-hour urinary volume was higher and urinary osmolarity was lower in ADPKD patients versus healthy controls in all quartiles of age. In the first quartile, these values were 2.1 ± 0.9 versus 1.4 ± 0.5 L/24 h (P = 0.002), and 497 ± 183 versus 600 ± 165 mOsm (P = 0.04), respectively; and in the fourth quartile 2.5 ± 0.9 versus 1.8 ± 0.5 L /24 h (P = 0.002), and 367 ± 113 versus controls 516 ± 167 mOsm/L (P = 0.001). In ADPKD patients, urinary volume tended to increase with age, whereas urinary osmolarity decreased (P = 0.003). In the study presented here, we found that young adult ADPKD patients (16 to 33 years) already had a markedly decreased ERPF when compared with healthy controls, despite an almost normal GFR and a modestly enlarged TRV. Because of the decreased ERPF and the tendency for a high MAP, young adult ADPKD patients had an increased RVR and an especially high FF. These abnormalities in ERPF and FF are an early phenomenon and remained present throughout the age quartiles. Also, microalbuminuria was already present early in the disease. In the young adult ADPKD patients, 24-hour urinary volume was higher and 24-hour urinary osmolarity was lower compared with normal controls. Urinary volume tended to increase, whereas urinary osmolarity decreased over the age quartiles of ADPKD patients. We found a slightly decreased GFR, accompanied by a much stronger decrease in ERPF, in young adult ADPKD patients. There are several possible explanations for this hemodynamic profile; for instance, that ADPKD is primarily a disease of the tubules and interstitium, and that extraction of hippuran could therefore be disturbed. However, the fact that we found the difference in these hemodynamic parameters in patients versus healthy controls, most pronounced in the young adult ADPKD subjects in whom tubular function and interstitium are still relatively preserved, suggests that this explanation is less likely. An alternative explanation for the observed renal hemodynamic profile could be a state of predominantly efferent renal vasoconstriction related to increased neurohumoral activation. Neurohumoral activation has been described to occur early in ADPKD (27), and efferent renal vasoconstriction related to increased neurohumoral activation is characteristic of other hypertensive conditions (28). We hypothesize that this hemodynamic profile indicates hyperfiltration. The loss of nephrons due to the disease process results in a decreased ERPF, whereas compensatory GFR goes up in the remnant nephrons. The presence of an elevated albuminuria already in the youngest quartile of ADPKD patients supports this hypothesis. The phenomenon of hyperfiltration could explain why GFR stays stable for several years and then rapidly declines (9,10). This hypothesis also indicates that GFR is indeed not an appropriate marker for disease severity, as has been suggested (10), and underlines the importance of a search for better markers of disease severity. To the best of our knowledge, no previous studies looked directly at possible hyperfiltration in ADPKD patients. Two studies so far suggested that patients with ADPKD may hyperfiltrate. Dimitrakov et al. (29) suggested hyperfiltration on the basis of measurement of creatinine clearance and serum β2 microglobulin levels. Another study described a high GFR in very young ADPKD patients (9.8 ± 5.9 years), as measured with a technetium 99m DTPA single-injection technique (30). Some of the ADPKD patients in our study had a GFR comparable to the values described in these studies (Figure 2). Importantly, in both studies no information was obtained on ERPF and FF and no comparison with healthy controls was made. This makes it less possible to draw firm conclusions whether there is indeed hyperfiltration in those patients. We found that FF was especially high in young adult ADPKD patients, whereas in healthy controls FF is high in the older age groups. The latter is in line with previous analyses, showing that higher BMI and older age are the main determinants of a higher FF (31,32). These data, in combination with the fact that we found a negative correlation between TRV and FF (R = −0.28, P = 0.004) suggests that hyperfiltration is a process that occurs early in the disease. A high FF, reflecting elevated glomerular pressure, has been shown to contribute to progressive renal function loss in experimental studies (33–36). Evidence in humans is sparse, but recently, in renal transplant recipients, a high FF was associated with increased graft loss, independent of BP, GFR, and proteinuria, which also supports a role for elevated glomerular pressure in humans (37). The finding of a high FF early in ADPKD could provide a rationale for prescription of agents that inhibit the renin-angiotensin aldosterone system (RAAS) early in the disease, because these agents are known to decrease FF and intraglomerular pressure (38,39). As yet there is no evidence that inhibiting the RAAS is indeed beneficial in ADPKD. However, the studies that were performed to investigate the efficacy of RAAS intervention to preserve renal function in ADPKD patients may have been too underpowered and had a too short of follow-up to reach firm conclusions (4,40). Of note, in our study, 71 of 103 ADPKD patients used an ACEI/ARB, but the group still had a very high FF [although patients using an ACEI/ARB had a FF lower than the patients who did not use an ACEI/ARB (30 ± 4 versus 32 ± 4, P = 0.01)], supporting the fact that inhibiting the RAAS also results in a decreased FF in ADPKD patients. At the moment, a large-scale study is being performed with 4 years of follow-up in which the efficacy of complete RAAS blockade to preserve renal volume and renal function is being investigated (HALT-PKD). Hopefully, this study will answer the question whether RAAS blockade is effective in preventing renal function decline in ADPKD (41). Our findings on RVR, RBF, decreased urine concentration, and albuminuria are in line with data from the literature. RVR and RBF have been measured in only two studies performed on the same cohort (15,16). RBF was measured in a subgroup of 131 patients using MRI. During follow-up, a reduction of RBF and an increase in RVR paralleled the increase in total kidney volume, and importantly, preceded GFR decline and predicted structural and functional disease progression in this cohort. This suggests that low RBF and high RVR could be good markers for rapid disease progression. However, these studies did not include a comparison with healthy subjects. We found RVR to be elevated early in the disease compared with healthy controls. In the first quartile of age, serum creatinine in ADPKD patients was significantly increased compared with healthy controls. The fact that GFR was not different suggests that other factors than renal function play a role (e.g., muscle mass). Hb levels were also different in the first quartile of age. Unexpectedly, ADPKD patients had lower Hb values compared with healthy controls. There was no association between use of ACEI/ARB therapy and Hb level. Patients taking these agents had the same Hb level as patients without these agents (P = 0.45), so use of ACEIs/ARBs is not a likely explanation. An explanation for the difference in Hb could be a diminished erythropoietin production. Unfortunately, we do not have information on erythropoietin levels. The increased 24-hour urinary volume and decreased 24-hour urinary osmolarity that we found in the ADPKD patients is consistent with the decreased concentrating capacity that has been described in these patients (12). Also, albuminuria has been described to occur at early stages of the disease (13). We also found a high prevalence of microalbuminuria in young adult ADPKD patients. In addition, we found a decreased ERPF and increased FF compared with healthy controls, even in young patients with no microalbuminuria yet. This suggests that early renal and vascular changes are present before occurrence of microalbuminuria, making ERPF and RVR likely to be early markers of disease severity. We acknowledge that this study has limitations. First, we studied age versus renal hemodynamic parameters in a cross-sectional study. In such a design, selection bias can occur. Also, patients were allowed to use their antihypertensive medication, potentially influencing renal hemodynamics. However, a lifetime longitudinal investigation of renal hemodynamic parameters is almost not feasible. Second, we did not control water intake. However, our patients drank ad libitum and did not receive advice to deliberately increase water intake. We believe that urine concentrating capacity in ADPKD is indeed lower at increased age. The strengths of our study include that we simultaneously measured various renal hemodynamic parameters in a relatively large group of ADPKD subjects in various stages of the disease. The simultaneous measurement of GFR and ERPF using the gold standard (clearance of iothalamate and hippuran) is the best surrogate to study hyperfiltration. Previous studies investigating renal hemodynamics in ADPKD used only GFR measurements, from which it cannot be concluded whether hyperfiltration is present when there is no information on RBF. Furthermore, we were able to compare ADPKD patients with age- and gender-matched healthy controls, enabling comparison with the normal situation. In conclusion, already at young adult age, ADPKD patients have marked renal abnormalities, despite only modestly enlarged kidneys and a near-normal GFR. These data suggest that in ADPKD, a renal hemodynamic profile, characterized by decreased ERPF and increased FF, may be an early sign indicating more outspoken disease severity. The finding furthermore indicates that ERPF and FF (in addition to renal volume and albuminuria) may indicate disease severity better than GFR. We are grateful for the assistance of Lucia Kadijk in the outpatient clinic and the technical assistance of Marian Vroom-Dallinga, Roelie Karsten-Barelds, and Dirkina Hesseling for renal function measurements. Furthermore, we acknowledge Peter Kappert, Annemarie Tienhoven, and Irene Willeboordse for their technical expertise with the magnetic resonance images. Finally, we thank Corrie Nieuwenhout and Annemarie Zantman for their secretarial assistance at the outpatient clinic.